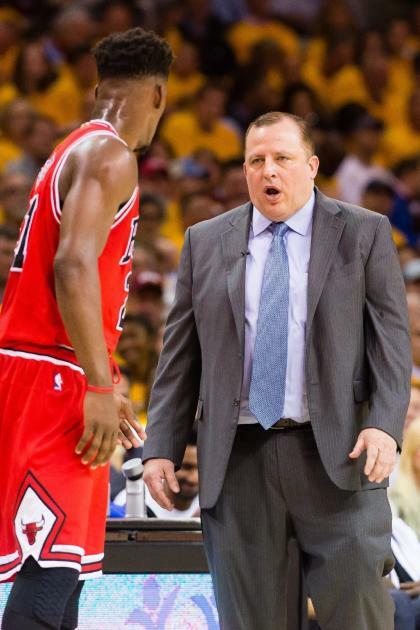 CLEVELAND – Outside the coach's office, there was life within the eyes of Tom Thibodeau. The possibilities percolated. For three years, the coach of these Chicago Bulls has come to the Eastern Conference playoffs with a battered roster bereft of Derrick Rose. For three years, they wondered whether they would ever be whole again, whether management's obsession with ousting Thibodeau would ever let him, let these players, make one more run for everything. "They sense that you don't get these opportunities all the time," Thibodeau told Yahoo Sports late Monday. "You've got to make the most of them. These guys are starting to build a chemistry. Whatever our circumstances are, we've got to go. As Rose makes an inspired return to a playoff stage that desperately missed him, Thibodeau is pushing closer to the end of his run here. This wasn't on his mind on Monday after a 99-92 Game 1 victory over the Cleveland Cavaliers; only winning. Only the opportunity now. Rose is becoming Rose again, slowly, surely, but the progression's unmistakable. It changes everything for Chicago, except this: Amid the twisted culture of Chicago's regime – where winning is losing, where success is failure – management can't wait to rid itself of one Tom Thibodeau. For everything Chicago management does to undermine the coach, this Bulls locker room has remained something rare in professional sports: unaffected and unrelenting. "Ahhhh, that's all noise," Thibodeau told Yahoo Sports. He won't do it. He won't think about endings on Monday night, when this feels so much like a beginning for these Bulls. "I want them to be mentally tough," Thibodeau said. "In this league, it's so easy to get sidetracked. There's so much noise. Trades. Free agency. This. That. Whatever. To me, none of that is important. All that matters is what we think. Are we doing the right things every day? Are we putting the proper work in? Are we playing the right way? Practicing the right way? That's how you play well in this league. All that other stuff is just noise, it doesn't mean anything." Thibodeau promises to be defiant until the end, until someone beats these Bulls four times in the playoffs. The reemergence of Rose, the rise of Jimmy Butler and the arrival of Pau Gasol make these Bulls a problem for LeBron James and Kyrie Irving. Rose is retracing his steps of greatness, allowing for adjustments of mind and body. It's coming, though. Between big shots and bigger passes, the Game 1 victory over Cleveland had been telltale for the Bulls' chances in this series. They had to get a game here with Kevin Love out for the season, with J.R. Smith out until Game 3. As much as anything, Thibodeau loves the chance he has to coach Rose again. This isn't the old Rose. In every way, Rose has been fiercely loyal to Thibodeau. He'd never do what James did to Cavaliers coach David Blatt on Monday night, insisting that the Bulls were "exploiting us with our coverage." When management has tried sidling to Rose, he's never sold out Thibodeau. When people have tried to blame Thibodeau for playing a part in Rose's rash of injuries, Rose has never blinked. In a lot of ways, the Bulls-Thibodeau partnership survived because of Rose. Even now, his stature won't stop the inevitable parting this spring. And when everyone else in Chicago wanted Rose back on the floor sooner than later with those knee injuries, Thibodeau never wavered with him. When someone in the organization leaked that the team doctor had cleared Rose to return, make no mistake: Rose knew it wasn't his coach. "I don't know of a guy who has gone through what he's gone through," Thibodeau told Yahoo Sports. "You're 22 years old. You're the MVP of the league. And it's been smooth sailing. One year in college, the championship game. Rookie of the Year. Conference finals. League MVP. And from the point he got that MVP until now, it's been all adversity. He's had to navigate through that. One year of rehab, that's a test of your will. But to do it three years? That's a tough deal. And he's still working at it. "When you miss that much, it takes you a long time to get it back. And to get that rhythm back into the game. I think he's learned a lot going through it. All of that adversity, it's been seeds of growth for him." For everything Rose has done to evolve, it will forever be a failure of management, and, yes, Thibodeau too, that they couldn't grow themselves. They became more entrenched, more embittered, more toxic. When a visiting scout visited the Bulls practice facility in the past year or so, he had the opportunity to watch the awkward, strange interplay between Bulls general manager Gar Forman and Thibodeau. Eventually, the man walked into the office of an assistant coach and asked: "What the hell is the deal here?" Before answering, the coach turned his fan on full blast. For the visitor, everything was becoming even stranger. He gave the assistant a befuddled look, as though to say, "What are you doing?" "I'm not taking any chances," the coach said, refusing to risk the possibility of those walls being bugged. The Bulls were walking past Thibodeau in the corridor between the showers and the locker room. Four years ago, Thibodeau and Rose tried to beat James and the Miami Heat in the conference finals and lost in five games. Tell Thibodeau that those Bulls were far lower on talent, and he bristles. "That's misguided," he told Yahoo. "We did have options. Luol Deng was a great option. Omer Asik and Kyle Korver, those guys were coming off our bench. But we didn't have, we didn't have Gasol. He's so skilled. The rebounding, the shot-blocking, the scoring ability. What people don't remember, those games against Miami, we could've won all of them." Thibodeau never does stay too long in the past, which was why he was back into this series, back into these Eastern Conference semifinals. "What I loved about tonight, with Derrick, he was trusting the pass. Now, he makes the pass – and boom – we've got Gasol. We've got Jimmy. We've got a real good shot." Yes, the Bulls have a real good shot now. And the best chance that they'll ever have to win a title here would be with Thibodeau – as terrific of a coach as Iowa State's Fred Hoiberg, management's choice to ultimately be the replacement. The Orlando Magic are waiting to watch what happens at season's end, league sources said, waiting to see how the team and coach dissolve the remaining two years on his contract and separate. "It's a great group of guys," Thibodeau finally said on Monday night. "That's the thing that makes it so good as a coach – all the adversity that they've been through, no matter what the circumstances are, they always rise up and give you what they've got." They've never had so much for Tom Thibodeau, never so much for this franchise. The Chicago Bulls are slowly, surely becoming whole again, and they're determined to give James and Irving a long series, determined to give them hell. The end is coming for Thibodeau with these Bulls – management is obsessed with it – but between now and then, something else has started here. Rose is becoming Rose again, and these Bulls are a problem for everyone in these playoffs. Here it was, the last stand for Chicago Bulls coach Tom Thibodeau, and it felt like anything but the end on Monday night in Cleveland. It felt like these Bulls were making up for lost time, like they've got a real run in them. "… We've got to go," Thibodeau said. "This is it." All these years, all this angst and you could see the possibilities in the coach's eyes on Monday night, hear it in that raspy voice. For now, these were still his Chicago Bulls in the Eastern Conference playoffs, and Derrick Rose is still his point guard. Chicago is a tough out in these playoffs, and maybe – just maybe – Tom Thibodeau is a tougher out in this job.